The Caps have finally gone to the dogs, but in a good way. 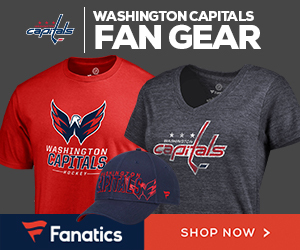 On Monday, the Capitals’ organization announced a new membership club called Caps Canines. The club offers dog owners an opportunity to get involved with the team through exclusive pet merchandise and special pet-friendly events. Similar in structure to the Caps Kids Club, the unique membership kit includes a lot of fun goodies sure to get you and your pup geared up for the 2018-19 hockey season and ready to rock the red. The kit features a Caps collar, leash, dog tag and rope flyer toy, the opportunity to pre-order the Caps Canine Calendar and an invitation to a Caps Canines signature event. Membership to Caps Canines costs only $30. The program supports Homeward Trails Animal Rescue, a Monumental Sports & Entertainment Foundation partner. Homeward Trails Animal Rescue is a non-profit organization that provides pet adoption in Virginia, Washington, D.C., and Maryland. The Capitals will host adoption days at Homeward Trails throughout the season, and each dog adopted on these dates will receive a special Caps gift. In the past, these adoption days at the arena have been highly successful and the cute pups make quite a splash on the concourse. Fans just love them, and many deserving rescue animals have found loving homes on adoption day. In addition, proceeds from the Caps Canines Signature Event and Canine Calendar will be donated to Homeward Trails. Monumental Sports & Entertainment Foundation has donated more than $250,000 to Homeward Trails through the sale of its Canine Calendar since 2014. If you and your pup would like to be a part of this exciting new club, you can register for Caps Canines at WashingtonCaps.com/CapsCanines and you are encouraged to share photos of your dog by using #CapsCanines and tagging @Capitals on social media outlets.